This rear axle is of very simple construction. The only tricky part is the fixing of the wheels to the axle/ metal bar. It is as simple to weld them to the axle, however not everybody has a welder. I would suggest taking just the rear axle to a engineering works to get the wheel to the rear axle so that both the wheels and rear axle turn as one. However it would be possible to drill a 5mm hole right through the middle of the wheel and axle, essentially fixing the wheel to the axle. 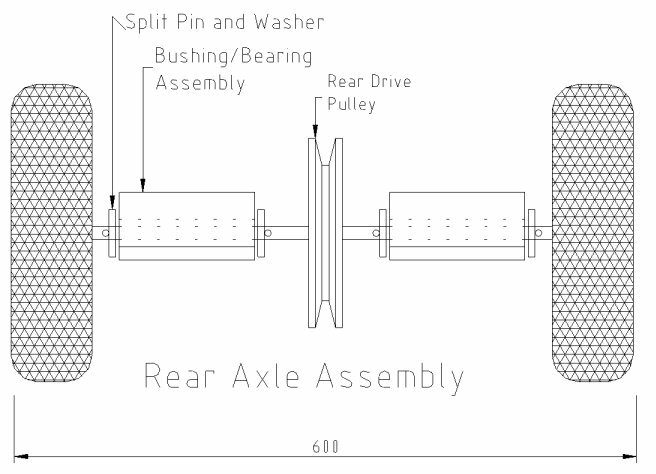 Below is a diagram of the complete rear axle with wheels attached. The wheels and the entire axle spin freely as one unit. The bushing/ bearing assembly allow the axle to be secured to the chassis. 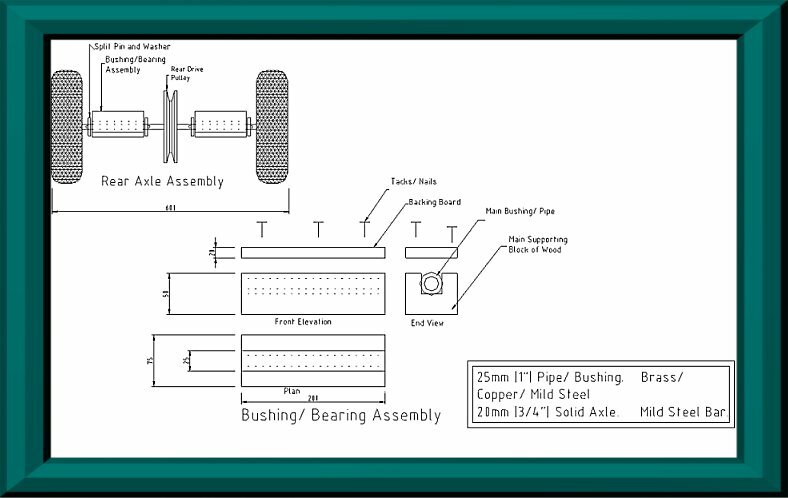 Below is a diagram on how to make these bushing/ bearing blocks quite simply. As I said before one has to secure both the wheels and the pulley to this live axle. This can be difficult to do however. The simplest way is to weld the wheel hubs and the pulley wheel to the metal bar/ axle. If required later the weld can be sawn/ ground off. If the pulley wheel is made from aluminium then it will have to be bolted to a metal plate to one side of the aluminium pulley and in turn welded to the axle. Apologies again for the crudeness of the pictures. A download of these pictures are available to download on the "Downloads" page. Again as for the front wheels grease will have to packed into these bushing/ bearing blocks to minimise wear as much as possible. Once this axle is made up and should look some what similar to the picture shown above it can be easily and quickly secured to the main frame/ chassis of the kart via nails and/ or screws. Before welding the wheel onto the axle make sure the pulley wheel is in the middle first, as well as for the bearing/ bushing blocks! other wise you would have to cut the wheels off and put everything necessary on the axle.